In everything we do, our specialized team excels in providing compassionate, quality care for patients and caregivers. The Milton J. 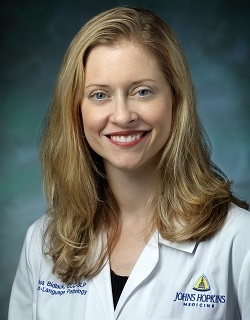 Dance, Jr., Head and Neck Center is the first choice of care for patients with head and neck cancer, voice, swallowing and communication disorders. The Milton J. Dance, Jr., Head and Neck Center is the employer of choice for health professionals. The Milton J. Dance Jr. Head and Neck Center also provides a wide range of programs and services to improve our patients' quality of life. Patients and family members receive exceptional care through counseling and education, discharge planning, home health care coordination, support groups, professional voice care, head and neck cancer care, interdisciplinary patient care conferences, and more. 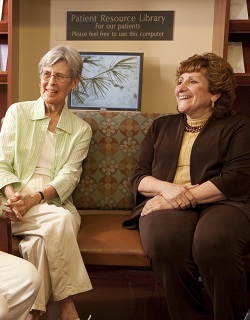 Every step of the way, our patients experience compassion from people who care in a healing, supportive environment. Lee Silverman Voice Treatment. Member of ASHA SID 3 and NATS. 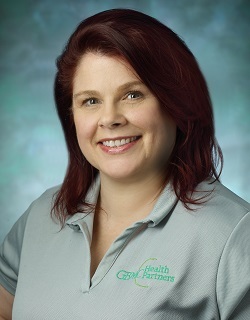 Melissa Bidlack, CCC-SLP, is a speech-language pathologist and singing voice specialist at Johns Hopkins Voice Center. 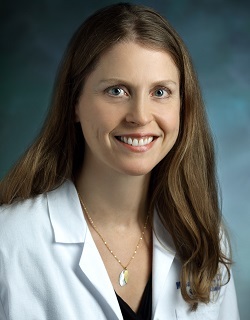 She completed her clinical fellowship at Johns Hopkins Bayview Medical Center, specializing in voice, swallowing, and neurological disorders. Ms. Bidlack received her Master of Science degree in Speech-Language Pathology from Columbia University Teachers College. She also holds a Master of Music degree from Rice University in Vocal Performance. 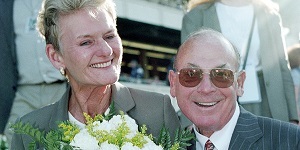 Prior to her career in speech-language pathology, she performed as a professional opera singer and served on the voice faculty at Whitman College. Member of ASHA, SID - 2 Neurophysiology and Neurogenic Speech and Language Disorders; SID-13 Special Interest Group 13, Swallowing and Swallowing Disorders (Dysphagia). Board Certified Brain Injury Specialist. 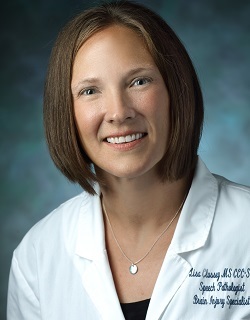 Lisa’s clinical interests are in the areas of swallowing disorders, adult speech, language, and cognition following neurological impairments including stroke and traumatic brain injury. Jordan graduated with his Master's Degree in Speech-Language Pathology in 2015 from Loyola University-Maryland. 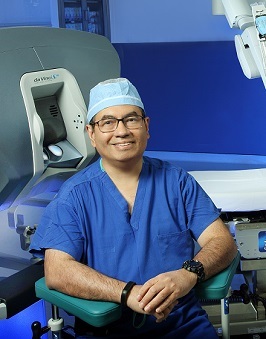 He completed his clinical fellowship at Mayo Clinic-Rochester. 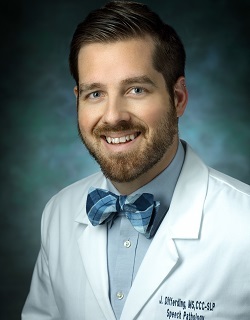 Jordan’s clinical interests are in the areas of swallowing, speech, language and voice disorders and rehabilitation, with an emphasis in the head and neck cancer population. 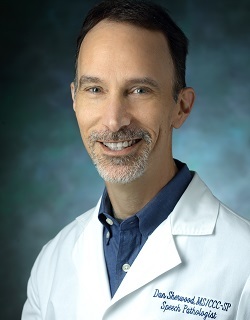 He is also a member of an international mission that researches and develops post-operative speech-resonance treatment services to children with cleft palate in underserved areas. 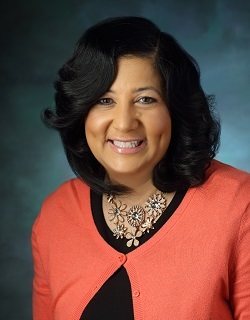 Board certified oncology social worker, member of the Association of Oncology Social Workers, National Association of Social Workers, and the Academy of Certified Social Workers. 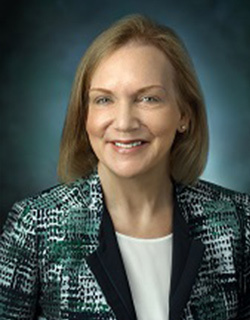 Dorothy has a special interest in assisting head and neck cancer patients and their families with the adjustments related to diagnosis, treatment and recovery. Karen has a clinical interest in assisting head and neck cancer patients and their families with the emotional adjustments and practical issues related to diagnosis, treatment and recovery. 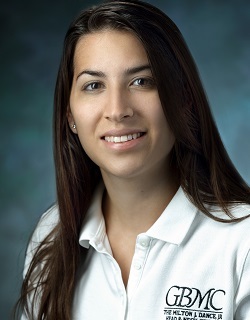 Natasha graduated from Villanova University with a Bachelor’s Degree in Psychology in 2010 and from Loyola University Maryland with her Master's Degree in Speech-Language Pathology in 2017. She completed her clinical fellowship here at the Milton J. Dance, Jr. Head and Neck Cancer Center. 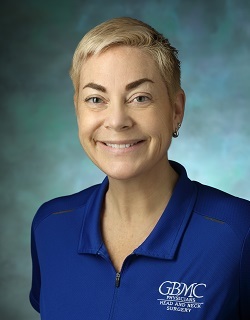 Her training has been focused on the evaluation and treatment of adult speech, language, cognitive, and swallowing disorders following neurological impairments including stroke and traumatic brain injury. 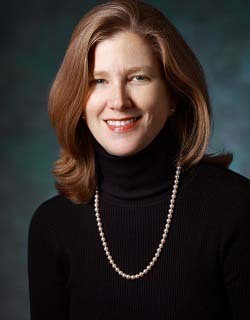 She also has experience in the evaluation and treatment of pediatric speech and language disorders with prior work at Kennedy Krieger and Lindamood-Bell Learning Processes. 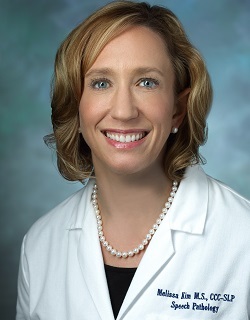 She is a member of the American Speech-Language-Hearing Association (ASHA) and the special interest groups: Neurophysiology and Neurogenic Speech and Language Disorders, Swallowing and Swallowing Disorders. Member of ASHA, SID 3, SID 5, SID 13, MSHA. 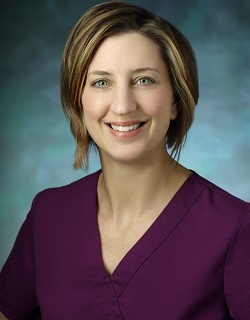 Melissa's clinical and research interests are in the areas of voice and swallowing disorders and rehabilitation, particularly in the head and neck cancer population. 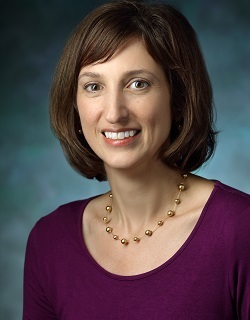 She is actively involved in evidenced-based research with patients receiving treatment for head and neck cancer. 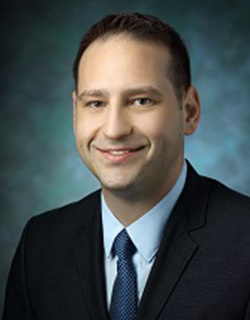 Jason’s clinical interests are in the areas of adult speech, language, cognitive, and swallowing disorders following neurological impairments including stroke and traumatic brain injury. 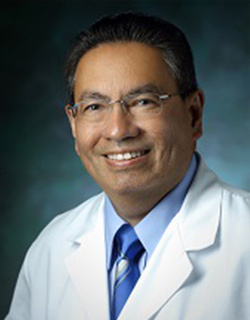 He has received specialized training in cognitive rehabilitation by the American Congress of Rehabilitation Medicine. 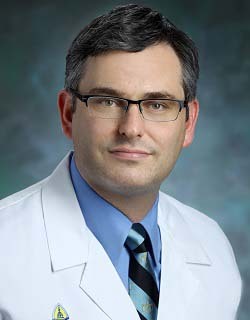 As an affiliate faculty member at Loyola University, he has instructed graduate students on the assessment and treatment of aphasia. 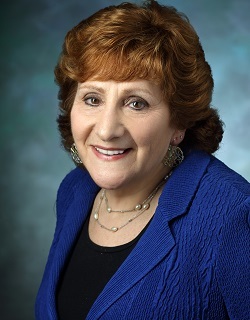 Barbara Pisano Messing, M.A., CCC-SLP, BCS-S, FASHA is the Director of the Milton J. 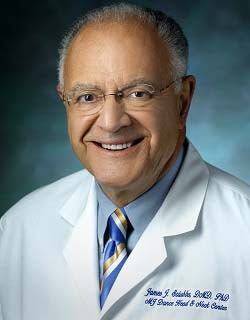 Dance, Jr. Head and Neck Center, Johns Hopkins Head & Neck Surgery and Johns Hopkins Voice Center located at GBMC in Baltimore, Maryland. 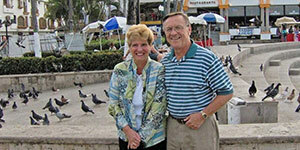 She is a practicing medical speech pathologist with 30 years of experience. 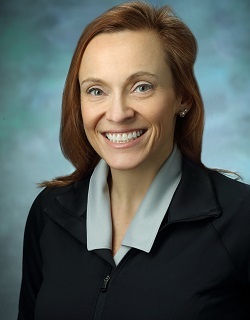 She is recognized as a Clinical Specialist in Head and Neck Rehabilitation and a Board Certified Specialist in Swallowing and Swallowing Disorders. 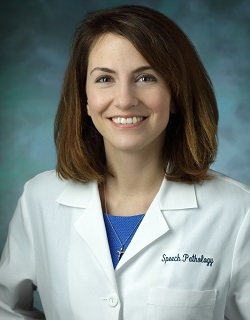 She lectures nationally and internationally on dysphagia, esophageal disorders and clinical pathways and outcomes in head and neck cancer. Her clinical and research interests are in the area of head and neck cancer rehabilitation, dysphagia and voice disorders. She is a PhD student at the University of Queensland focusing on her research on dysphagia in head and neck cancer patients. Keri has a clinical interest in providing support and management of the nutritional needs of cancer patients. Keri is recognized as a Board Certified Specialist in Oncology Nutrition. She founded Wellness Wednesdays, held monthly. This educational session consists of nutrition information and cooking demonstration. These sessions are aimed at improving the knowledge of healthy eating and lifestyle for cancer prevention. 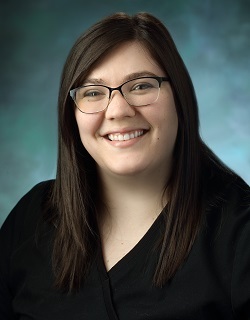 Marisa received her Master of Arts degree in Speech-Language Pathology from Northern Illinois University and completed her clinical fellowship at the Johns Hopkins Voice Center. Prior to her career in speech pathology, she worked as a professional actor in New York City and Chicago. She holds a Master of Fine Arts degree in Acting from The Actors Studio Drama School and a Bachelor of Arts degree in English from Clemson University. 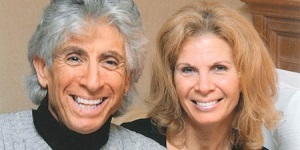 Marisa is certified in Lee Silverman Voice Treatment and has extensive training in the Alexander Technique, yoga, and dance. Focusing on rehabilitation and retraining of the professional voice. Special interests include breathing retraining and movement education, with training in alternative/complementary disciplines, including Hanna Somatics®, Associative Awareness Technique™, Optimal Breathing®. Jessica graduated from Loyola University Maryland with her Master's Degree in Speech-Language Pathology in 2011. She completed her clinical fellowship here at the Milton J. Dance, Jr. Head and Neck Cancer Center. 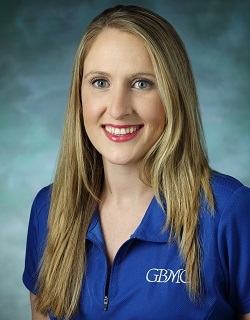 Her training has been focused on the evaluation and treatment of adult swallowing, and speech-language disorders with special interest in head and neck rehabilitation and voice. 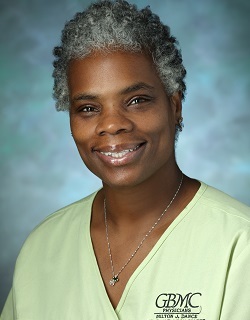 Karen is a member of SOHN and ONS, and is certified in Otorhinolaryngology, Head-Neck Nursing (CORLN) care. 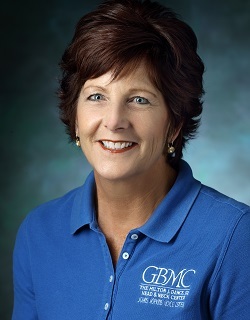 Karen has 20+ years experience working with head and neck oncology patients and their families/friends. 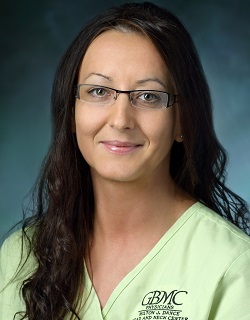 She enjoys helping patients achieve their individual goals during and after therapy. 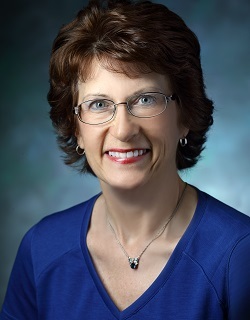 Karen has expertise in the management of tracheostomies. 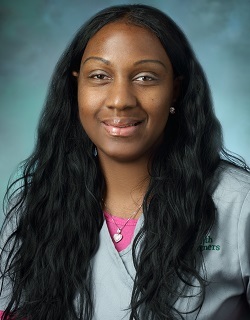 She is available for inpatient and outpatient tracheostomy consultations. 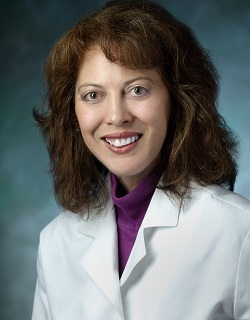 Karen is a member of the Oncology Nursing Society, and is active in the Society of Otorhinolaryngology and Head-Neck Nurses on both the local and national levels. 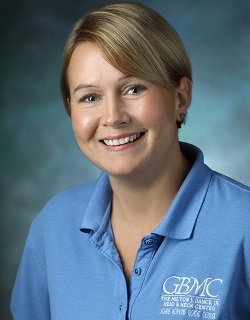 Sabrina is 1 of only 2 Administrative Surgical Posting Specialists at GBMC. Her role is to support Surgical Oncology patients in their journeys from Diagnosis to Surgery Day and she has over 25 years of experience in doing so. She has a very warm and inviting smile and personality that others are drawn to. She loves the interactions with our patients and is always willing to offer a kind, encouraging word, a hug or a laugh to lift their spirits. 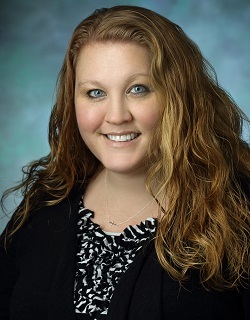 Colleen assists the Administrative-Clinical Director with developing and implementing office practices that assure the best possible experience for our patients, hiring and training of front office staff, establishing objectives for the front office and evaluating performance. She also schedules office appointments and provides clerical support for the physicians and clinical staff. 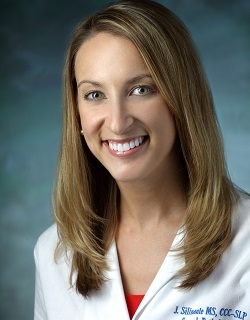 Amanda is currently the Patient Accounts Coordinator for the Johns Hopkins Voice Center. Her duties include verifying insurance eligibility and obtaining authorizations and referrals for procedures. She is also responsible for verification of billing for the Voice Center doctors as well as the speech pathologists. 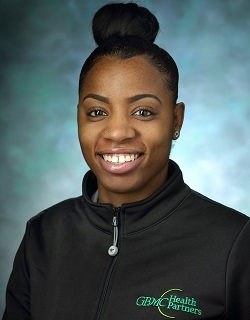 Terryn is currently the Medical Assistant for the Milton J. Dance, Jr. Head and Neck Center. She has been a Medical Assistant for 8 years, and started her career at the University of Texas El Paso during her husband's deployment to Iraq. Her duties include direct patient care, obtaining vitals, updating medical history, assisting with office procedures, processing labs and results, medication refills, monitoring patient flow, as well as administrative support to physicians and office staff. Provides front desk scheduling for the Milton J. Dance, Jr. Head and Neck Center and the Johns Hopkins Voice Center at GBMC. Responsible for registration, scheduling, and preparing all necessary information for patients appointments. Collects copays, processes/closes credit cards and records patient charges. Schedules and coordinates new and follow up patient appointments for The Milton J. 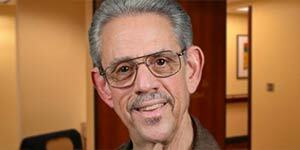 Dance, Jr. Head and Neck Center and The Johns Hopkins Voice Center with telephone support. Primary registration for The Johns Hopkins Voice Center. Review of patient billing sheets, referrals, and office notes in preparation for scheduled appointments daily. Collects co-pays, processes/closes credit card payments and records patient charges. Catherine provides secretarial and scheduling support for the department. Schedules and coordinates new and follow up patient appointments for Johns Hopkins Head and Neck Surgery. She prepares daily schedules, registering patients, ensuring referrals and authorizations are obtained and all intake information and clinical notes are available for scheduled appointments daily. She collects co-pays, processes/closes credit card payments and records patient charges. Performs detailed and precise data entry for patients in Epic. Participates in staff orientation and education. Ewa worked for 8 year as a registered nurse in Poland. 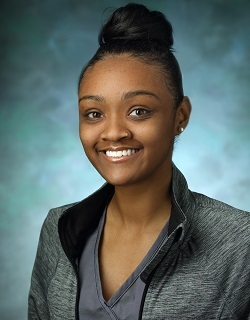 She joined John Hopkins Voice Center at GBMC in December, 2013 after receiving the Certified Clinical Medical Assistant credential from National Health Career Association. Ewa is responsible for escorting patients, obtaining vitals, updating electronic health record, sending reports, refilling medication requests, setting up instrumentation and procedure rooms. Provides secretarial support for the department. Schedules and coordinates new and follow up patient appointments for The Milton J. Dance, Jr. Head and Neck Center and The Johns Hopkins Voice Center. She is responsible for scheduling pediatric patients as well. Responsibilities includes organization of daily appointments standard work flow. She reviews patient billing sheets, referrals, and office notes in preparation for scheduled appointments daily. Collects co-pays, processes credit card payments, and records patient charges. Ursula also verifies insurance eligibility and obtains prior authorizations for services. She also is responsible for verification of daily clinical billing at the center. Josita Peters joined The Milton J. Dance, Jr., Head & Neck Center in August of 2006. She started as an Insurance Specialist, then transferred over to Senior Medical Secretary. Josita's responsibilities are preparing the exam rooms for patients, setting up for different procedures, tracking SLP reports, sending reports to physicians, ordering supplies, obtaining vitals, and lab work. Provides secretarial support for the department. Schedules and coordinates new and follow up patient appointments for The Milton J. 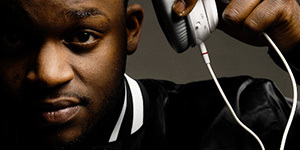 Dance, Jr. Head and Neck Center and The Johns Hopkins Voice Center with telephone support. Primary registration for The Johns Hopkins Voice Center. Prepares and prints daily schedule and distributes to appropriate personal. Review of patient billing sheets, referrals, and office notes in preparation for scheduled appointments daily. Collects co-pays, processes/closes credit card payments and records patient charges. Participates in staff orientation and education. Monitors research studies being done at The Milton J. Dance Jr. Head and Neck Center at GBMC. Verifies that our center and study personnel are conducting research according to protocol and regulatory requirements to ensure protection and ethical treatment of our patients whom participate. Perform monitoring activities of studies; collecting accurate and verifiable data and documents. Facilitates and participates in the informed consent process and conducting research patient visits. Emily is the Patient Accounts Coordinator for the Milton J. Dance, Jr. Head & Neck Center. Her duties include verifying insurance eligibility and obtaining prior authorizations. She is also responsible for verification of billing for the Dance center clinicians. With us since July, 2014 Christine is responsible for overseeing daily operations of scheduling and the front desk staff. 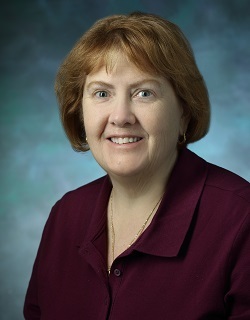 She handles phone calls for the Dance Head and Neck Center and the Johns Hopkins Voice Center. She schedules and registers patients primarily for the Dance Head and Neck Center. She also prepares patient charts, requests doctors' notes as needed, and makes follow-up calls for clinicians and staff. Krystal is currently a Medical Assistant for the Milton J. Dance, Jr. Head and Neck Center. She is a new medical assistant. 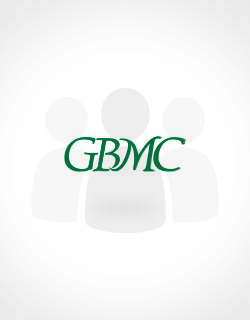 After getting her certification in October 2018, she completed her internship at GBMC. 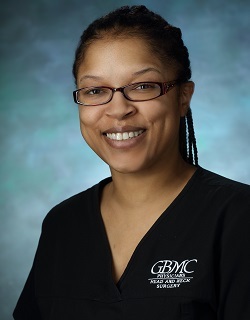 Her duties include direct patient care, obtaining vitals, updating medical history, assisting with office procedures, processing labs and results, medication refills, monitoring patient flow, as well as administrative support to physicians and office staff. 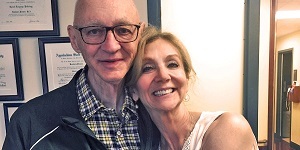 Jeanne Vance's and Laddie Dance's dream for cancer patients to see their future as an opportunity for hope and peace of mind is realized every day by the patients at the Milton J. Dance, Jr. Head and Neck Rehabilitation Center. You've surely heard the name 'Fender' if you're a fan of rock legends like Jimi Hendrix or Eric Clapton, but what you might not know is that those iconic instruments also have therapeutic uses as well. 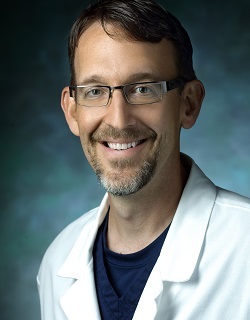 "If you teach people to breathe more economically and more efficiently, there is not as much pressure put on the vocal cords," said Daniel Sherwood, senior speech pathologist at the voice center. "If we take the work out of it, then those cords get a break."